Title : Africa ex magna orbis terre descriptione Gerardi Mercatories desumpta studio & industria G.M. Juniorius . Map maker : MERCATOR Jr., Gerard. Date : Duisburg and then Amsterdam, (1595) 1609 or 1619. Size : 15.0 x 18.6 inches. / 38.0 x 47.2 cm. Description :A classic map of Africa. The map first appeared in Gerard Mercator’s Atlas sive Cosmographicae..., published posthumously in 1595. As stated in the title, this map is by Gerard Mercator's grandson, Gerard Mercator Jr. He extracted the information for this map from his famous grandfather's large world map of 1569. Mercator also used as sources the Waldseemuller and Gastaldi maps. This map has a high degree of accuracy especially along the coastline that was unsurpassed by any other 16th century cartographer (Klemp). Much of the interior of Africa defers to the traditions of Ptolemy; the Nile river is shown with the two lakes and the Mountains of the Moon across southern Africa. Mercator does show European advance into the interior. 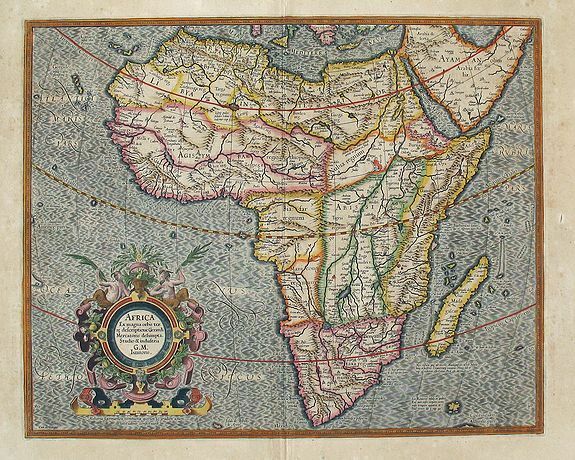 For example, Mercator shows Portuguese exploration up the Cuama (Zambezi) River into the interior of south central Africa in the region of Monomotapa or Benamataxa, as he named it on his map. "Ca. Portogal" (the Portuguese Fort) is placed on the map within the junction of the Spirito and Cuama rivers. Mercator tried to adhere to a more scientific approach and did not include the numerous beasts of other cartographers. The only figure within Africa is the seated legendary priest-king Prester John in Ethiopia. The cartouche is quite decorative with fruit and two satyrs. The fine script is superb and the sea has Mercator's signature "miore" pattern.